The latest disco music was available right off campus at "Records and Things". A young Phillies pitcher named Steve Carlton wins his second Cy Young Award. Debbie Boone's "You Light Up My Life" topped the charts, spending 10 weeks at No. 1 on Billboard . Rocky was still in theaters. Billy Joel would tour Bethlehem and the valley, perhaps setting the stage for his later hit Allentown. But a loss to the team that beat them last year would see all of Lehigh's opportunities fade away, the chance to qualify for the eight-team postseason playoff and championship Bowls, the opportunity to reverse last year's humbling loss to the Leopards. 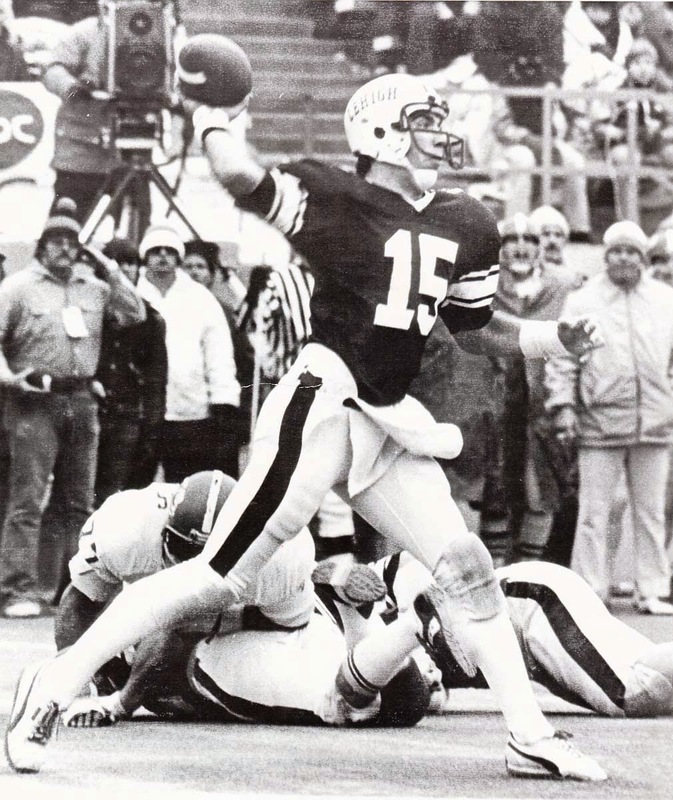 Early on, quarterback Mike Rieker seemed poised for a historic season, starting with a suprisingly easy 49-0 victory over UConn, who was then competing in Division II in the Yankee Conference. Big plays, especially to his talented split end, Steve Kreider, gave opposing defensive coordinators a big problem. Rhode Island, considered a tough competitor for the Lambert Cup, came to South Bethlehem expected to compete in a tough game against the Engineers. Instead, Rieker and Kreider surgically picked apart the Ram defense to the tune of a 42-16 rout. By the end of the game, Rieker wasn't just passing the ball, he was also blocking to help score touchdowns - the final score of the came on a double reverse to RB Lennie Daniels, with Rieker as lead blocker. "We played one hell of a ball game," feisty head coach John Whitehead said after beating Rhode Island. As the season progressed and the 8-2 Engineers approached the game with their big Rivals, Lehigh crept up the Lambert Cup standings, hovering around 3rd and 4th behind UMass, New Hampshire, and Delaware. A quality win over VMI helped the Engineers stay alive in the Lambert Cup and playoff race, while a surprise 20-0 loss to Rutgers hurt Lehigh's chances. Whitehead's iron style of coaching, and the newfound passing attack, was making a magical season happen in South Mountain. "Coach Whitehead was a perfectionist. In single word descriptions he was fair, tough, hard, compassionate if you did right, and ruled with the fist if you did it wrong," Rieker said. "All of those things made him as likable as a coach for any player that played under him, because they knew that whether he was hard on you or patting you on the back, we all had the same intention, to win ball games. He molded and handled everybody individually but ultimately he was the dictator and it was his way or the highway." Nobody was arguing with the results at Lehigh. "Although we may have butted heads when I was a player and was a coach we had a great relationship that enabled us to socialize, play golf together and have fun together after my playing days," Rieker said. "He was a great friend and a big part of my life. I wouldn't have what I have today if it wasn't for Coach Whitehead." Still, despite the magic coaching touch, Lehigh needed help to win the Lambert Cup and a chance at the Division II playoffs. It would require UMass upsetting the UNH Wildcats to give Lehigh a chance at the award for the best team in the East, but it was achievable, with a little help. It would also help Lehigh's postseason chances greatly. "We really needed to put it on Lafayette to get them to look our way," Rieker said later. Lehigh's prolific passing combo was breaking records. Against Bucknell, a 47-13 win, Rieker would get 463 yards passing, easily eclipsing the old mark. 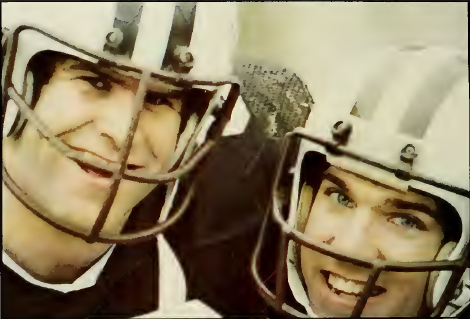 Rieker's 23 touchdown passes and Kreider's 12 touchdown receptions at the end of the regular season were Lehigh records, too. Lafayette's student paper was all too aware that Lehigh's chances at the postseason depended on a victory against them. "A win tomorrow would almost certainly eliminate the Engineers' chances of a postseason berth," The Lafayette said. Lehigh and Lafayette had recently added a new wrinkle to the pre-game festivities: undergraduate women fielded flag football teams and faced off against each other in the run-up to the Rivalry. 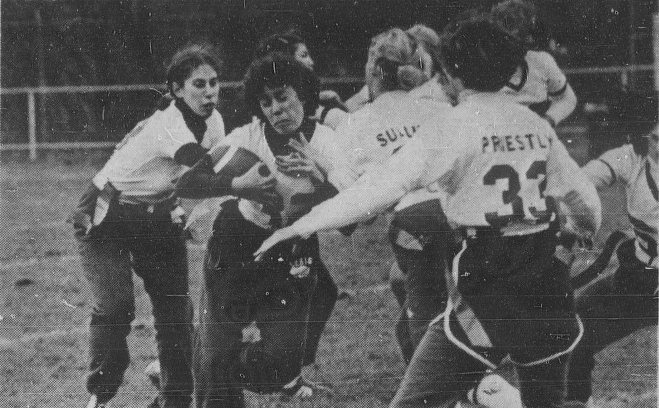 Lehigh, who only had started admitting women a few years prior, struggled against their arch-Rivals in these games: the Lady Engineers, led by Jo-anne "Franco" Harris couldn't keep up with the Lady Leopards in 1977, according to The Brown and White, falling 33-6 for their third straight loss against their arch-Rivals. 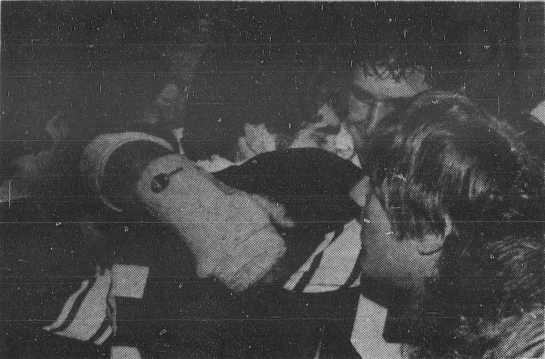 With so much at stake, both schools' officials feared a replay of the postgame violence that marred the end of the 1976 game and the worrying traditions of after-game rioting and tearing down the goalposts. Both schools made a big play of signing non-violence pacts before the game. There was a real worry that there wouldn't be enough policemen in the city of Bethlehem to help keep order after the game was over. Interestingly, the stakes of the game meant that the post-game violence wasn't as intense in years past. Arrests were down, and the goalposts only came down with about 90 seconds left in the game - rather than at halftime, which had happened only a couple of years prior. On the field, though, the Rivalry was as intense as ever. "A lot of verbiage went back and forth," Rieker said, with the players heckling each other between plays. At times, Rieker recalled, the referees had to step in to settle down the players and keep the game moving. Lehigh seemed like they were about to choke on the chance given to them. Surprising many, Lafayette remained neck-in-neck with Lehigh, keeping the game close at halftime against Lehigh's vaunted offense. Penalties and turnovers - and maybe some Lehigh nerves - kept things very much in doubt, and Rieker-to-Krieder, for the most part, grounded. "We held a slim 14-10 lead at halftime and I don't think I have to tell you what the locker room at halftime was like with Coach Whitehead at the helm," Rieker later recalled. Whitehead undoubtedly caused the paint in the locker rooms at Taylor Stadium to curl. The nervousness among the Lehigh faithful turned to panic midway through the 3rd quarter when Lafayette's reserve quarterback Scott Sautter ran around right end to give the Leopards a 17-14 lead. When the Leopards got the ball back and were in position for a long field goal, doubts were running high. "With the gridders trailing 17-14, defensive back Pete Fenton blocked a 50 yard field goal attempt by Dave Heverling," The Brown and White reported, which would have been a Lafayette school record had it converted and a huge boost of extra momentum for the Leopards had it worked. Instead, the momentum swing from the blocked kick caused the Engineers to spring into action. And Rieker, shut out from the scoring up until the blocked field goal, would play a huge part. One play later, a fired-up Rieker found his favorite target, Kreider, for a 45 yard gain to threaten to score. One play after that, Rieker did, finding Kreider in the end zone to help give the Engineers a 21-17 lead. From there, the floodgates opened. Lehigh would furiously score two more touchdowns for emphasis, scoring off of Leopard miscues to clinch a 35-17 win that was a lot more in doubt than the final score might indicate. It was a season where the Engineers scored in bunches, and it was this late bunch of scoring that would be the difference. Rieker, who had no scores until late in the third quarter, would end the game with 153 yards passing and 3 touchdowns, enough to earn him MVP honors. An elated locker room saw their dreams of a championship alive - and later that afternoon, the phone call would arrive to say that indeed, their win delivered them the Lambert Cup, and a playoff game. "The Leopards put a scare in the the Engineers, but a championship team usually comes back - and it did," The Brown and White said, presciently. 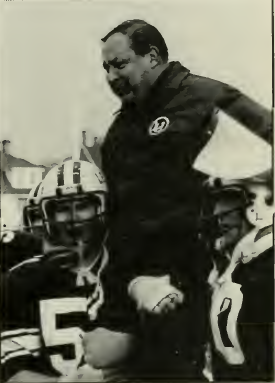 For three weeks after their scrape with Lafayette, Lehigh would travel to Wichita Falls, Texas, with John Whitehead's incredible Engineer team to shut out Jacksonville State 33-0 to give Lehigh its first - and only - national championship in football. 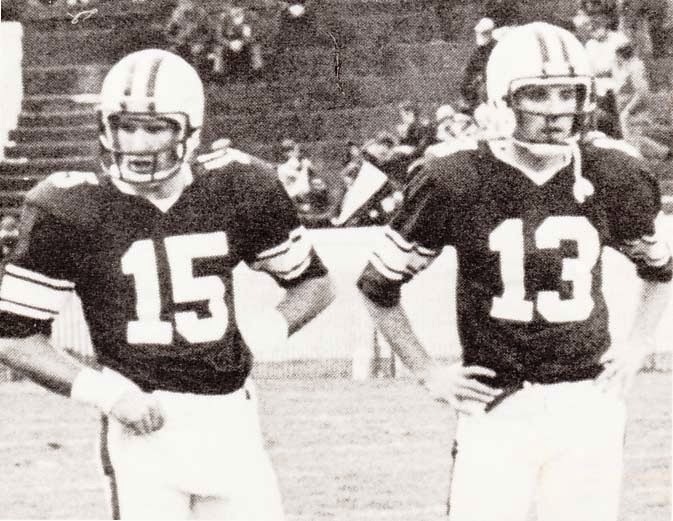 The Division II National Championship was theirs - but it might not have happened if Pete Fenton hadn't blocked that fateful kick in the Rivalry.